Nehemiah McFarlin brings the ball upfield against Oceanside during the first half Friday. San Diego County’s top-ranked high school football team, the Mission Hills High School Grizzlies, did their thing Friday night overwhelming an undermanned Vista High School squad 47-21 at Mission Hills. One more victory and the Grizzlies will be undefeated going into the playoffs. 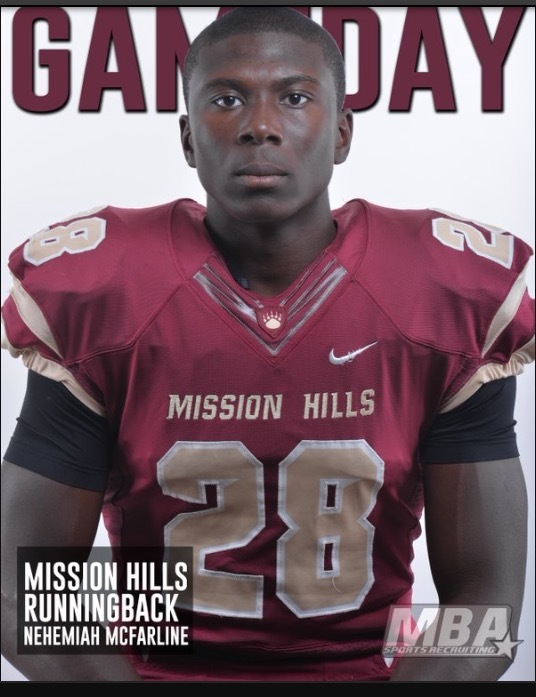 Mission Hills star running back Nehemiah McFarlin rumbled to scores on his second, fourth and fifth carries on the night. Touchdown runs were 26 yards, one yard and 63 yards respectively. That was all she wrote as Coach Chris Hauser rested his star asset after the first quarter during which the Grizzlies charged to a 19-0 lead as they blew out the visiting Vista Panthers. The Grizzlies tacked on three second-period touchdowns, all of them the result of Vista fumbles. The third score coming on Elija Bulls’ 34-yard fumble return. That touchdown pushed the lead to 40-0. In other Avocado East and Valley League match-ups, San Marcos defeated San Pasqual 39-0 in a non-conference match. Rancho Buena Vista bested Del Norte 31-17. Fallbrook humiliated Orange Glen 69-6 while Valley Center beat Escondido 38-21 at the Valley Center homecoming game. Cal Preps provided an overview of Avocado East and Valley League match-ups and standings as teams head into the final week of the regular season.